ASM is an engineering company creating bespoke/special-purpose machines, from semi-automatic workstations to fully-automated production lines. In order to react quickly, validate our technical solutions and test customers’ prototypes in real conditions, ASM is equipped with a 3D-printer. 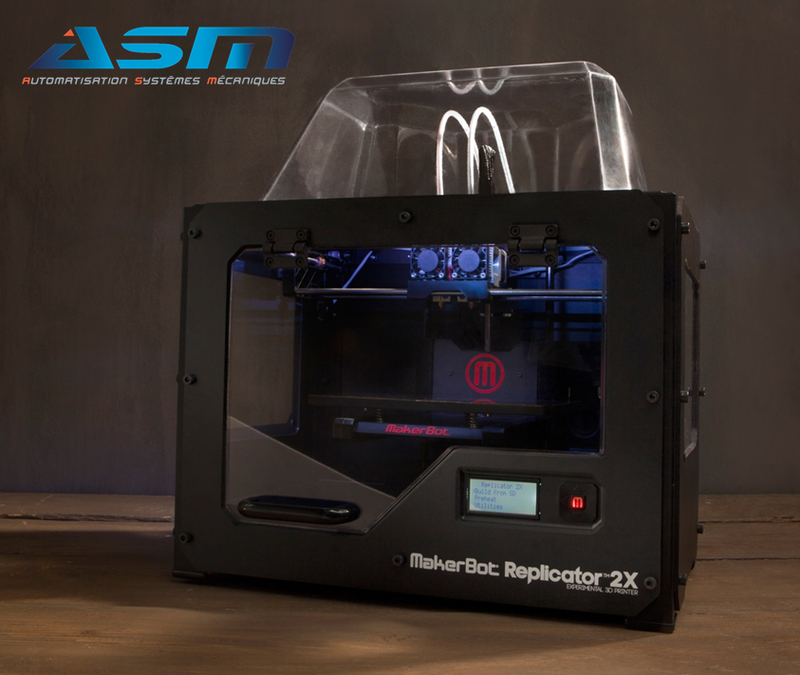 It is a Makerbot Replicator 2X with dual extrusion, especially made to manufacture ABS parts. The first tests are conclusive and the parts are already used on our special machines. ASM engineers and technicians have a simple goal: to provide the technical solution or service that best meets customer requirements in terms of cost, time and quality. Business managers: with their strong technical knowledge, they will innovate and offer unique solutions to meet your needs of bespoke machines. Research department: both in Mechanical and in Automation, our team is composed of professionals with experience in both manufacturing and production. These skills allow them to design robust machines (simple, with reduced cost and easy maintenance), while meeting the needs required by important volumes. Technicians: with the experience gained in recent years on projects in various technologies, they assemble your machines on site and ensure that your operators and technicians are trained to better optimize your production. Since its inception, ASM has voluntarily been working in multiple areas. This allows our engineers to address any queries and transfer technical solutions to new fields of application. This “outside-the-box” approach allows our team to find creative, innovative and cost-efficient solutions.